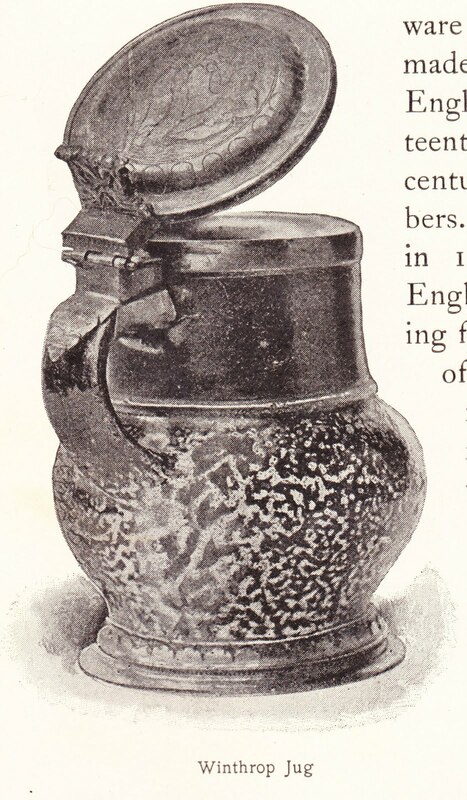 An English writer in 1579, spoke of the English custom of drinking from "pots of earth, of sundry colors and moulds, whereof many are garnished with silver, or leastwise with pewter." Such a piece of stoneware is the oldest authenticated drinking jug in this country, which was brought here and used by English colonists. It was the property of Governor John Winthrop, who came to Boston in 1630, and now belongs to the American Antiquarian Society in Worcester, Massachusetts. It stands eight inches in height, is apparently of German Gresware, and is heavily mounted in silver. The lid is engraved with a quaint design of Adam and Eve and the tempting serpent in the apple-tree. It was a gift to John Winthrop's father from his sister, Lady Mildmay, in 1607, and was then, and it still now, labelled, "a stone Pot tipped and covered with a Silver Lydd." I found some more about this mug/jug in a February 2010 blog post by Ellen Denker on Sawdust & Dirt. The post is a review of the 2009 book "Salt-Glazed Stoneware in Early America." And one of the pieces of stoneware featured, with a photo, is the Winthrop Jug. 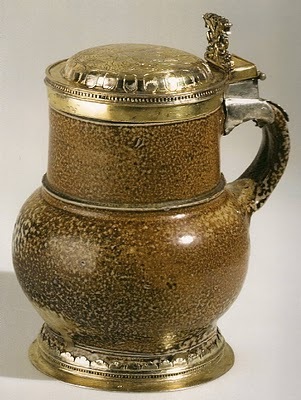 According to the blog post, "the German mug [was] made 1550-1575 with engraved English silver-gilt mounts for the cover, rim and foot, and carried by John Winthrop, future governor of the Massachusetts Bay Colony when he crossed the Atlantic in 1630. ... The mug continued to be passed down through generations of the Winthrop family for another two hundred years, until it was given to the American Antiquarian Society in 1825. Without the silver mounts and the long Winthrop family history, this is otherwise a rather mundane mug made in Cologne or Frechen of grey stoneware body coated with a rich brown slip and fired with a salt glaze. Surely the potter who made it thought of it as nothing more than one more piece qualifying for his daily count. Yet it was held in high esteem in the sixteenth century (the English silver mounts tell us that) and acquired magical properties as it was passed from generation to generation of Winthrops, each passage carried out on the Feast of St. Michael (Michaelmas recognizes the coming of autumn and shortening of days, while celebrating the accomplishments of Archangel Michael, who defeated Lucifer in the battle for the heavens)." 1. 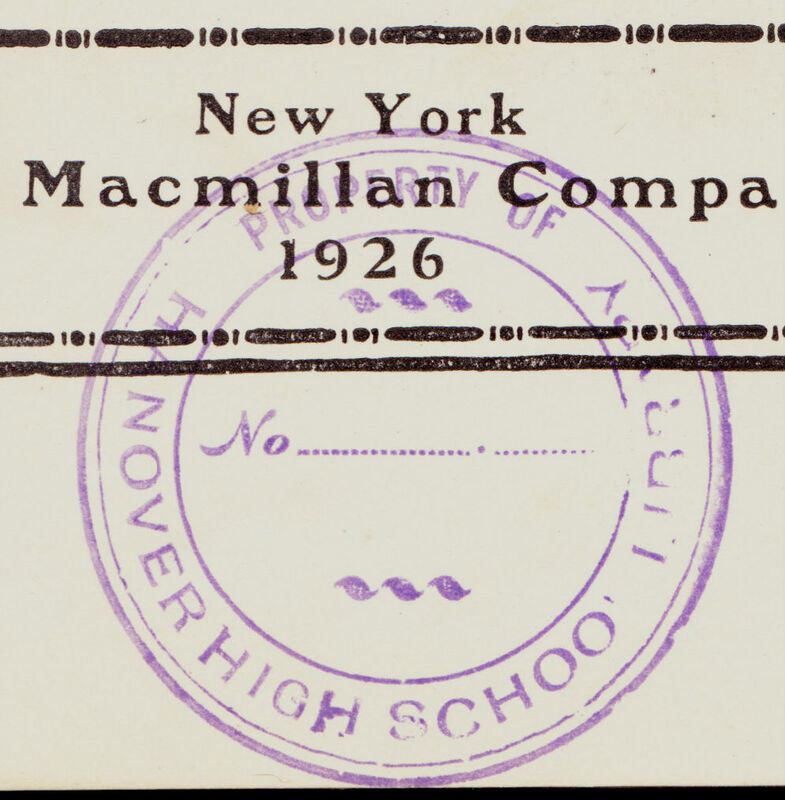 "Home Life in Colonials Days" was originally written and published in 1898. 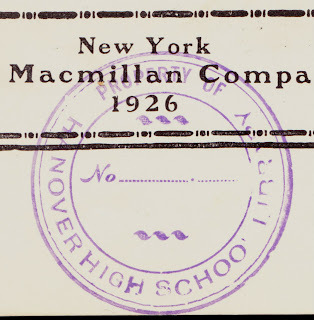 This edition, by The Macmillan Company, was once property of the Hanover High School Library, as evidence by the stamp on the title page. It's a wonderful book, with chapters on The Kitchen Fireside; The Serving of Meals; Food from Forest and Sea; Indian Corn; Meat and Drink; Hand-Weaving; Girls' Occupations; Jack-knife Industries; Travel, Transportation, and Taverns; Sunday in the Colonies, and much more. I have been especially enjoying the chapter Food from Forest and Sea, in which I learned that salmon and shad were "lightly regarded in colonial days," so much so that "farm laborers in the vicinity of the Connecticut River when engaged to work stipulated that they should have salmon for dinner but once a week." No, instead of salmon and shad, the most valuable fish of the period was cod. And the finest tables had the finest dun-fish (codfish cured in a particular manner, so as to be of a superior quality) upon them for Saturday's meal.